Thermenregion is a region of two halves. 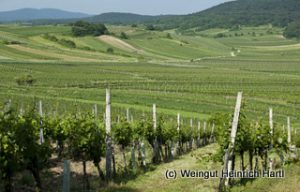 The northern part, abutting Vienna, is home to white grape varieties rotgipfler and zierfandler, while the southern part, around Sooss, Tattendorf, Bad Vöslau and further south, is home to red pair pinot noir and saint laurent. Underscoring this division, soils in the south are stony and gravelly rather than based on the limestone of the north. Cistercian monks had brought pinot noir from Burgundy, establishing a winery at Freigut Thallern in Gumpoldskirchen in 1141. At a tasting of Austria’s top 200 red wines from the 2009 vintage at Vievinum in 2012 (see later post), I rated pinot noir from Thermenregion as the most exciting. There are nearly 780 hectares of saint laurent in Austria, 20% of which are in Thermenregion. 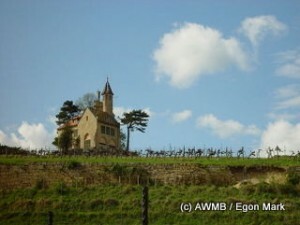 Total pinot noir amounts to 650 hectares, 17% of which are in Thermenregion. More than half of all saint laurent and pinot noir is in neighbouring, bigger, Burgenland. Medium pale red, sandalwood aromas and toast. Attractive youthful strawberry nose, with strawberry and cream palate attack. Medium body, elegant, silky tannin attack, spicy tannin and supple sweet fruit. A calm wine, with some nice concentration and good length. Medium pale cherry red colour with nose of strawberry sprinkled with crushed black pepper. Supple, soft-stewed redcurrants and strawberries, with a silky texture and refined palate. Delicious supple, bright, warm fruit with good length. Medium pale cherry colour. Ethereal strawberry and redcurrant flavours, with perfume building mid-palate. Fine, taffeta texture, really fine mouth-feel. Rich, delicately ripe red berry fruits, with freshness and warmth as hallmarks. Long finish. Very nice. Medium pale colour. Hints of plum amid redcurrants and raspberries. Supple velvety texture, very smooth fruits, gentle, warming finish (not as in alcohol). Good. Medium deep ruby red. Spicy with a bit of tar perfume. Medium body with dark forest berries and autumn hedgerow, fine-fine grain tannin, savoury liquorice note at the back palate. Fine, moreish flavour. toasty, vanilla notes amid dark forest berries. Supple and sweet fruit with sweet tannins, soft fruits. Enticing mouthfeel. Dark fruits with fine-boned frame. Nice. Meduim dark cherry colour. Spicy nose, more savoury than fruity. Wood-smoke, charcoal and plum fruits. Erring to foursquare. Medium dark cherry colour. Wafting smoke and dark cherry fruits. Medium body with fine-grain tannins, supple, dry-ripe fruits, plum, dark cherry, blackcurrant. Nicely balanced with attractive layering of flavour. Good. Spicy with overt toastiness on the nose; dark, bass notes on the palate attack, rich and complex, with sophistication; layered dark spices and fresh leather, hint of raw meatiness. Textured, complex, long in-palate length and finish. Vg. you omitted the best winemaker of the thermenregion: stadlmann, making wine since 1780. in addition to their fantastic zierfandlers & rotgipglers, they make an elegant, beautifully structured and delicious pinot noir.